I HAD always thought that Tokyo was the only city that offered the best shopping experience in Japan, thanks to its hustle and bustle, numerous skyscrapers, high fashion and beautiful city dwellers. That is, until Osaka changed my mind. I was on a six-week sabbatical in Japan and decided to spend four nights in Osaka, which is two and a half hours away from Tokyo via the Shinkansen bullet train. From the moment I stepped out from the station, I spotted landmark shops bearing the familiar logos of Uniqlo, Zara and H&M and immediately, I knew it was going to be a wonderful day. I always loved strolling in malls while on a holiday. I like window-shopping and seeing what’s on offer overseas that wasn’t available in Malaysia. I would describe myself as a “discreet spender”; I spend only when it’s necessary, and preferred owning fewer things because I’m constantly on the move and like travelling light. I thought the shopping arcade between Shinsaibashi and Namba was just one of many shopping malls in Japan, but I ended up enjoying every bit of its unique shopping ambience. I went to the shopping arcade twice during my stopover in Osaka, partly because I stayed at Namba, and it was located just across the hotel. The first time I was there, I couldn’t resist shopping to my heart’s content. I had better self-control on my second visit, as I took in the sights and sounds of the shopping street outside. There were many things to discover along this shopping stretch. Among my interesting finds are Gu (pronounced as gee-you) clothing outlet. It was pure madness here as tourists just grabbed anything they saw in this sister brand of Uniqlo, the fourth most popular casual wear brand in the world, and Japan top brand in this category. If you think Uniqlo products are reasonably priced, Gu is even more so, with a wide range of fashion wear. Gu targets young women, with overseas outlets only currently available in Shanghai and Taipei. I walked out of the store armed with a light feather jacket for ¥2,990 (RM86), and a pair of black jeans and a long-sleeved shirt at ¥1,490 each. I also loved Swedish brand H&M’s green initiative. You can earn a discount voucher by donating unwanted clothes to its outlets. I received such vouchers in Kuala Lumpur, and got the same in Osaka when I decided to get rid of a bulky, old jacket to make space for my luggage. Then there are the drug and cosmetic stores. It was baffling to see droves of Asian tourists scurrying to these stores and shopping like there was no tomorrow. You see them lugging shopping baskets around, and walking out with many shopping bags, leaving you to wonder what did you miss. These outlets sold products from medicine, snacks and drinks to cosmetic products and household items. In my shopping basket were heating eye pads to relieve tiredness, a green tea facial wash, moisturising pads to protect my throat from the cold air while I sleep, an ergonomically-designed fingernail clipper, and a sun block which isn’t available in Malaysia. Fuelling the tourist shopping spree at these drug stores was the tax-free scheme in Japan for tourists. Japan increased its sales tax to 8% on April 1 this year from 5%. The rise was the first in 17 years as the government aimed to rein in public debt. This means everything the Japanese purchased is 3% more expensive than before. 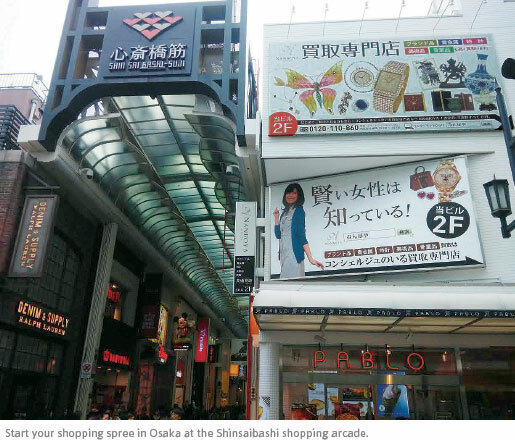 However, tourists can get full tax rebates, saving a whopping 8% of their bill if their shopping sum was more than ¥5,000 or ¥10,000, depending on the type of goods. I ended leaving Shinsaibashi, feeling content. What an eye-opener it was. I am certianly coming back to Shinsaibashi!